Inside Storey: Summertime . . . and the Livin' Is Easy . . . .
Summertime . . . and the Livin' Is Easy . . . .
As many of you know, my husband and I (and our then only son Ben) moved to Massachusetts from New York about 14 years ago. We fell in love with a house in a wonderful neighborhood a few miles outside Northampton, and we bought it posthaste. However, our move was delayed by a few weeks because my husband insisted that the builder put a deck off the back of the house. At the time I just wanted to begin our new life and was a bit impatient about waiting, but now, every single beautiful day that I spend on that deck, I thank him. The one consistent fly in the ointment, however, has been furniture. We had a set of outdoor furniture that we bought when we first moved, but it was cheap and temporary, and when it eventually fell apart, we sent it off to the dump and never replaced it. We missed a ton of family dinners on that lovely deck and a ton of dinner parties that could have moved outside because we just had a mental block about what to put there . . . until a few months ago. I realized that I had always wanted an old-fashioned picnic table, with built-in benches, on that deck. Coincidentally, we had just begun the editorial process on a new book that was to be published this spring, entitled The Vegetable Gardener's Book of Building Projects, and one of the projects was . 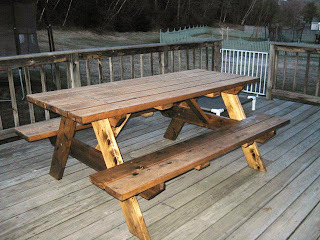 . . a picnic table. Simple, sturdy, and ready for a family of four to eat burgers and corn on the cob, even. After the building projects had been photographed, our editorial team offered them to employees as a fundraiser for a local charity, and you'd better believe I snapped up that picnic table tout de suite. And a few weeks ago, when we had an unseasonably warm spell, my husband fired up the grill, and we sat at my object d'art for a family dinner. It only took 15 years. If you'd like to make this table yourself (and I encourage you to! It's beautiful and simple to do! 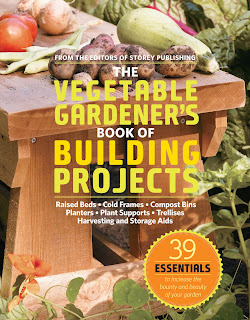 ), check out pages 104 to 108 of The Vegetable Gardener's Book of Building Projects, available right now.